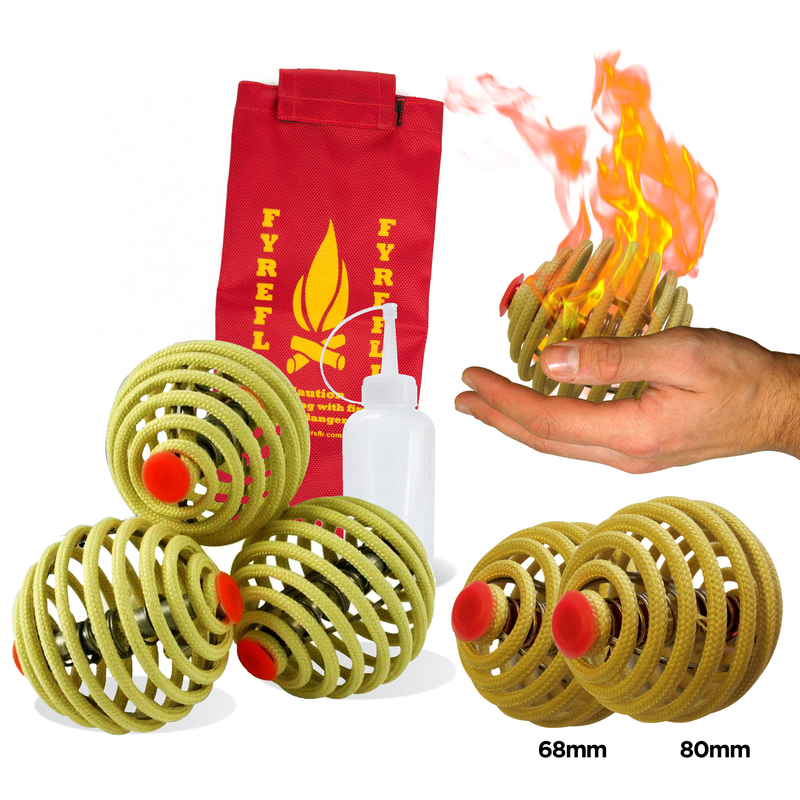 The Fyrefli fire juggling balls are the first and only fire juggling balls you can use without the need for fireproof gloves! The spiral fireproof cage surrounds the central wick and fuel reservoir. The cage ensures the flames stay at least one inch above your hands (provided you only hold the fire balls from below) allowing you to juggle fire with your bare hands. Before you set these balls on fire you need to soak the Kevlar spiral cage with water. One way off doing this is by getting a bowl with a bit of water (2-3cm) and roll the balls in it but be careful you don’t wet the wick it the middle. The balls will get a little hot after a long use, but with a little practice you can juggle with these balls for around 5 – 7 minutes quite comfortably. The 68mm fireball is the standard and most popular size and comes with a FREE carry Bag & Fuel bottle. 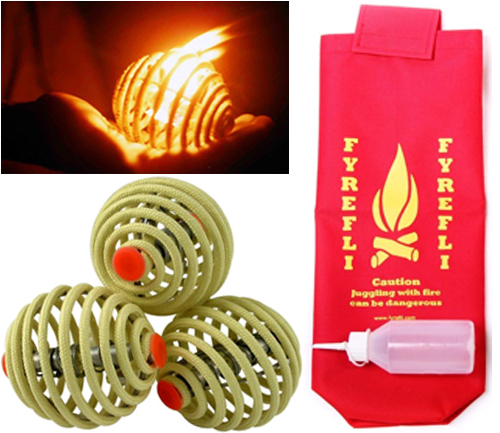 Diameter: 80mm, Weight: 135g per ball Contents: 3x Fire Juggling Balls, Fuel Bottle, Instructions and Bag Price shown is for a set of 3x Fire Juggling balls + FREE Bag & Fuel Bottle! Fyrefli - a manufacturing source for fire juggling props. Manufacturers of fire wick, fire rope, fire balls, fire diabolo, fire devilsticks, firestaffs, fire torches, fire poi and much more. Fyrefli wick and rope are produced from high quality para-aramid fibre, guaranteeing maximum fuel absorbency. Do remember to re-fuel your wick and rope before storage - have lots of fun and great burns!